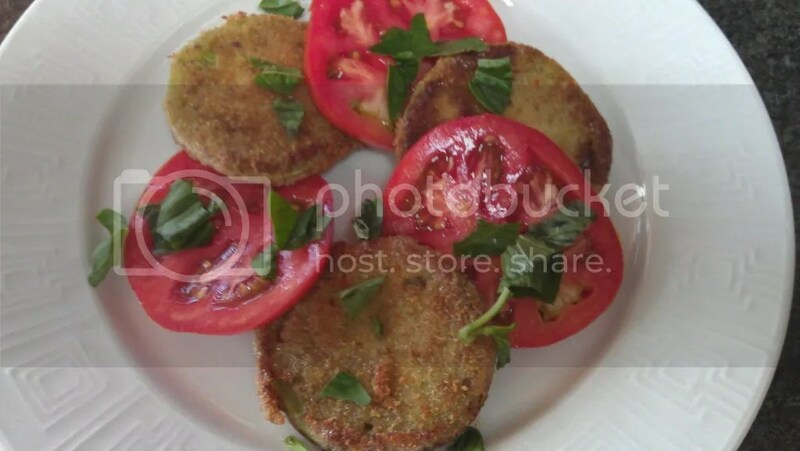 So I grew a large crop of tomatoes, they are not quite ripe yet so I tried frying them green. The results were deliciousness. Wash and slice green and red tomatoes into 1/8 inch thick slices. Heat Skillet to Medium high heat add butter. Set red tomatoes aside. Sprinkle salt and pepper onto green tomato slices. Beat egg! Dip green tomato slices into egg mixture then into bread crumbs. Fry two minutes per side or until golden brown. place onto plate alternating between red and green tomato. Top with basil leaves, salt and pepper. Serve while still warm.